It's another meatless Friday in our house in observance of Lent. The inspiration behind these nachos came from the southwestern egg rolls at Chili's. They are one of my favorite appetizers. I love the flavor combinations and thought they would taste great as a nacho dish and they did. They were fantastic! Heat oven to 425°. Coat a baking sheet with cooking spray; spread chips evenly on sheet. In a bowl, combine beans, rotel, corn, spinach, and cumin; spoon over chips. 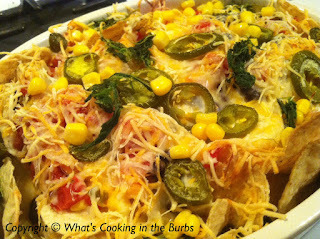 Top with jalapenos and cheese; bake until cheese melts, 5 to 6 minutes. Serve nachos topped with onions, salsa, and sour cream. Enjoy!